We are dedicated in extracting the pure essence of nature. For us adapting to the modern world means blending traditional methods with careful analysis and esthetics. This is a universe where the respect we have for nature’s values and our love for fine taste ,art and beauty defines elegance. A true connoisseur will feel it in every drop. Driven by our passion for uniqueness, we are committed to continuous research and development of products, out of natural raw materials, in order to deliver excellence in the world of global customer experience. Our olive oil enhances the experience of all cooking, in salads, on your favorite bread and can even be consumed straight on a table spoon in the morning. 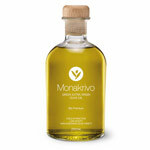 Olive oil of the Koroneiki variety harvested at Messinia province, a well known variety that origins from the most famous olive tree in the world. TGTL pretends to be one of the largest exporters of specialty foods in Europe distributing its products from around the world in gift boxes. In a really short period of time, through an ongoing commitment, to surprising the market with trendy products combining art, fine food and culture, the TGTL-Think Global Taste Local brand name, has become “A Recognized Mark in Quality Products and Packaging” in the gourmet food industry. The firm “OUROGAL S.A” was built in 2007 and is entirely dedicated to the process of transformation and merchandising all products of the “Sociedade Agricola Casal das Sarnadas”, owner of 98% of the capital, and still open to other players of olive oil interested in the sector of premiums and gourmets olive oil. It is a greenish golden oil, thick and sweet, which yields a markedly fruity oil, with obvious fragrances and flavors of ripe fruit, tomato, wild herbs, cooked artichoke, and green apple. It has a long, yet delicate finish. We are a family business love Olive Oil, and with great experience and tradition in the olive sector. Therefore, we are dedicated to obtaining one of the best olive oils. Olives are cultivated in Greece for the last 55,000 years. This is one of many reasons that Greek olive oil is considered the finest in the world. We in Euphoria are doing our best to carry on that proud tradition. We are a company with an experienced family history in agronomy which its main desire is to promote the culture of oil and its many qualities. Our priority is to create a top quality product with multiple beneficial health properties, obtained thanks to a careful personal dedication throughout its whole process, without forgetting at any time our great respect for the Environment.